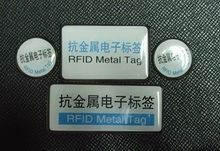 China’s Daily RFID has launched a new mini RFID tag for metal surfaces. The tag, measuring just 9 millimeters in diameter, uses a 3M-designed self-adhesive backing to attach to any metal surface. The 13.56 MHz RFID Metal Tag-08 is compliant with ISO 15693 and ISO 14443 standards. The tag offers a read range of up to 100 mm depending on conditions. The new mini tag is designed to withstand harsh conditions. Encapsulated versions of the tag are also available, and have been deployed in some asset tracking solutions for warehousing and railway applications.